We are getting quite a few users who double click the PayPal payment submission button either when registering as a new member or when updating their memberships. I've tried adding a "don't do that" messagein BIG RED letters on our membership page but I don't believe that I can modify the actual page on PayPal. Apologies as I'm a newbie with this plugin -- I inherited the site and its setup from someone who walked away...long story. At any rate, my question -- is there something in the s2member plugin configuration that I'm missing, or better yet, is there some way to make it impossible for users to submit double payments? These usually occur within 1-2 minutes of one another so I suspect the users are thinking nothing is happening so they click the button again. This then becomes a pain when the users see the double billing on their payments and we have to go thru the refund process or worse yet, they file a claim with PayPal. Any suggestions on where to start would be greatly appreciated!! I know how it can be to inherit a website... I'll try to help you make it as painless as possible, at least when it comes to s2Member. If I were having that issue, what I'd do as well, would be adding a very clear message next to the button about not clicking it twice (I see this often on payment pages around the web). Are you using PayPal buttons or the s2Member pro-form? Could you show me the payment page? You can send it to me privately if you don't want to make it public (click on my name and then the "Message" button). Hmmm....I clicked on your name - and your login name -- but only see additional info about you, no "Message" button. Maybe I'm looking in the wrong spot?? But bear in mind, this is a website in a retirement community so apparently, you can lead a horse to water but you can't make it sip just once! If I can find that Private Message option, I'll send you a link to the site and even set you up with credentials to login if you like. It should be enough to keep them from clicking more than once... Did you ask those that got the double charge, if they clicked only once? Did you try, and were you able to reproduce this behavior? I mean, clicking twice on the button to get a double charge? I find it odd. I have not personally tried to replicate it but we get at least a few each week - either renewing or registering as a new user. Until I put that message up there a week or so ago, we got bombarded with them as the snowbirds returned to Florida and renewed. I'd say the majority are renewals if that makes a difference. In pretty much each case, the person admitted to clicking twice so I was hoping there was something that could be done to eliminate the possibility of clicking it twice. -- grey it out after 1 click or whatever. I'm not sure, but I think it's occurring on the PayPal end of things -- after the user gets directed over that site -- but I'm not sure if it's in some parameter that gets passed their way. Odd. I just sent you a private message, so you should be able to reply to that. I have not personally tried to replicate it but we get at least a few each week - either renewing or registering as a new user. Until I put that message up there a week or so ago, we got bombarded with them as the snowbirds returned to Florida and renewed. Got it. So you'd say the message did make a difference. I think it's occurring on the PayPal end of things -- after the user gets directed over that site -- but I'm not sure if it's in some parameter that gets passed their way. I don't know either. I had not seen this reported before. Did you enable logging already so we can get more info about those transactions? I too find it odd that double-clicking the button would generate a duplicate payment since s2Member assigns unique invoice numbers to PayPal payments. Could you please check the PayPal account and ensure that it is set up to reject duplicate invoice numbers? See the first part of this PayPal KBA to learn how to do that at PayPal. IF your PayPal account is not set up to reject duplicate invoices the first thing you need to do is to configure that as above. That should solve this problem, although I think the root cause is probably some sort of caching rather than simply double-clicking the button. Edited 02/13/19 to add link to PayPal article. That did it, Cristián! I'm walking out the door right now though and will get back to you later tonite. I'll also check those PayPal setting mentioned. Thanks again - chuck. Thanks for this suggestion also. Our club treasurer handles the PayPal stuff so I'll work with her to double check that bit. I believe she'll be back in town later tonite or tomorrow. That did it, Cristián! I'm walking out the door right now though and will get back to you later tonite. Could you please check the PayPal account and ensure that it is set up to reject duplicate invoice numbers? See the first part of this PayPal KBA to learn how to do that at PayPal. Thanks! Didn't know about that setting. One other thought that may or may not be applicable. I do get copied on the “Notification of payment received” emails from PayPal. The emails that are from duplicate payments are typically a minute or so apart — that’s how our treasurer typically catches them proactively. I just checked a couple of them and, while they don’t have an Invoice Number, they do have a 17 digit Transaction ID and they are not duplicates. Again, I’ll check that PayPal setting when I get back in front of my PC. Yes! Forgot to put the link in my post. Mea culpa. Thanks! Almost forgot... that site does not have any caching plugin installed -- e.g.WP Super Cache -- that I use on my personal site. You probably already saw my reply to JediShark confirming that our PayPal account is set to not allow duplicates so that at least eliminates that variable. Regarding the" message making a difference" question...yes, I guess SOME users are reading that and some of those are actually doing it- But it is still frustrating for our treasurer so I'm still tasked with trying to find the root cause and fixing it. However, it is very important to disable logging once you go live. Log files may contain personally identifiable information, credit card numbers, secret API credentials, passwords and/or other sensitive information. We strongly suggest that logging be disabled on a live site (for security reasons). I setup a test sub-domain and can easily clone our prod site over to it with UpdraftPlus so was thinking it might be possible for me personally to replicate the error after turning on the logging there. But I think s2member is licensed to work with only one site, correct? Thoughts??? I'm pretty sure that s2Member will work on a dev site even without an unlimited sites license, at least it did when I worked for Web Sharks. I'd give it a try, the worst that can happen is it won't work. You really need those log files to see what is happening. I think that both Cristián and I will be surprised if double-clicking is actually causing your problem. I would be more inclined towards thinking its a caching problem. If PayPal buttons cause duplicate payments when double-clicked I would think this would be a problem well beyond s2Member sites. Of course, I've been wrong before. yes, I guess SOME users are reading that and some of those are actually doing it- But it is still frustrating for our treasurer so I'm still tasked with trying to find the root cause and fixing it. Of course, we want to get to the root of the problem. What I wanted to know was if it was the double clicking of the button what could actually be causing the double transaction, or if it was sometihng else happening afterwards. That's why I wanted to confirm that less users clicking twice actually seemed to reduce the number of times this happens. It's fine to have it on for troubleshooting, that's its purpose. The warning is there because it stores some data that you may not want others to see, in case someone breaks into the site. Just delete the log files after you're done using them. I setup a test sub-domain and can easily clone our prod site over to it with UpdraftPlus so was thinking it might be possible for me personally to replicate the error after turning on the logging there. But I think s2member is licensed to work with only one site, correct? This is perfectly fine, the single-site license refers to production sites, staging/development is fine and you can have all you need. If you can reproduce the behavior in the tests clone, that's good enough for troubleshooting. We'll soon find out! Everything is backed up with UpdraftPlus and I'm in the process of cloning it over to the dev area. Now that I confirmed the settings on PayPal for not allowing duplicate payments is set correctly, I kinda doubt if it's an issue on their end. What were you referring to in the way of a caching problem? Is there someplace I could look to help there? I have to do some running around while the site is copying over so I'll try to replicate it over there myself in a bit. I've got bad news and...well, just bad news! I cloned the prod site over to my dev sub-domain; cleaned up the form to reflect the correct website; turned on logging; then gave it 2 shots. For the first one, I filled out the membership form and clicked on the yellow PayPal Check out button just once, thinking that there might be someplace on the PayPal site to click twice. But no, there was only the blue spinning "Processing" circle. When it stopped, I was taken right back to the previous page on our website. 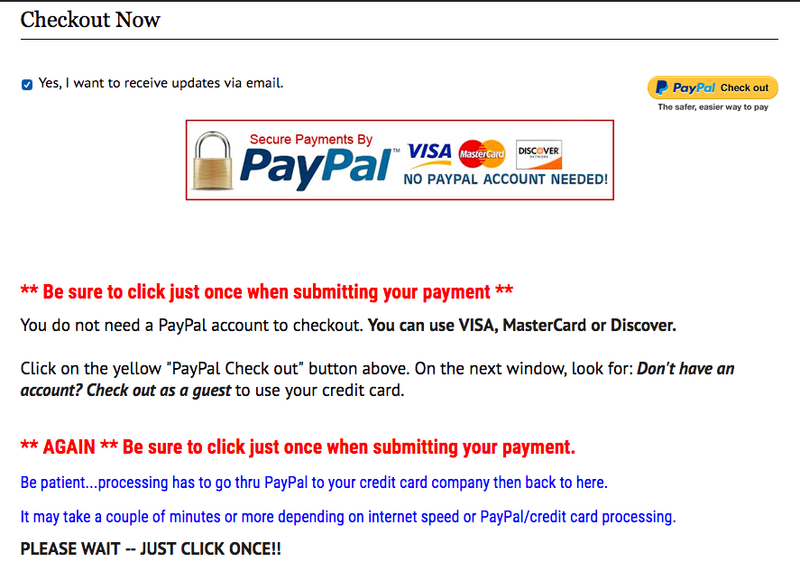 So, thinking that maybe clicking on the yellow PayPal Checkout button twice might generate the error, I tried that. But nope -- same results. At this point I have one silly idea as to what these users might be doing to generate 2 payments but before I run that by you, I just wanted to see if you had any other ideas or if you wanted me to set you up with an admin account on our dev area so that you could check things out there??? Thanks for the update, Chuck. Yeah, if you could send me privately the admin login to the tests installation, I'll take a look and test. You didn't try disabling all other plugins to remove the possibility of a conflict, right? And did you enable logging to get some entries from those tests? If not I'll be doing it myself when you send me the info.